Bullseye Event Group, the Official Events and Travel Partner of the Indianapolis Colts, is hosting the kickoff of the Colts VIP Tailgate event that rings in the new football season with a bang! Ticket Available Now. Colts fans! The Indianapolis Colts 2014 Season Home Opener is under the big lights – Monday, September 15 at 8:30 p.m. EDT at Lucas Oil Stadium. Bullseye Event Group, the Official Events and Travel Partner of the Indianapolis Colts, not only has fantastic seats available for Monday night's home opener against the Philadelphia Eagles at Lucas Oil Stadium but is also hosting the kickoff of the Colts VIP Tailgate event that rings in the new football season with a bang! 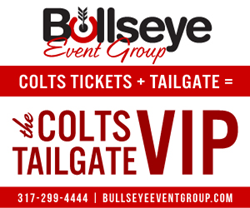 Bullseye Event Group is your official host of The Colts VIP Tailgate, which has its premier before the Colts Monday night home opener. Enjoy VIP tailgating not only outdoors, but in a climate-controlled indoor location at The Crane Bay Event Center, a short walk from Lucas Oil Stadium. Open three hours prior to kickoff, VIP tailgaters can get ready for some football in a family-friendly environment, enjoying premium tailgating food and drink, including Kobe Beef sliders, Ruth’s Chris Filets, Shrimp and Grits, Scrambled Eggs, Caesar Salad, Mashed Potatoes and Macaroni and Cheese from Ruth’s Chris Steakhouse. There will also be food from local favorite Another Broken Egg Café. In addition, Colts cheerleaders, former Colts players and NFL alumni are scheduled to appear. Colts VIP Tailgate season passes and individual game tickets are also available from Bullseye Event Group. Tickets are on sale for the Colts VIP Tailgate and the Colts Season Home Opener on Monday, September 15 at 8:30 p.m. EDT. Don’t miss out on the chance to meet cheerleaders and players, enjoy fantastic tailgate grub and attend the very first home game of the season. Contact Bullseye Event Group at 888-900-6564, or visit Bullseye’s website: http://www.bullseyeeventgroup.com. Bullseye Event Group is the Official Events and Travel Partner of the Indianapolis Colts. As a secure, official source for travel, hotel, pregame parties and tickets, Bullseye Event Group is a direct and dependable source for The Colts VIP Tailgate, Super Bowl XLIX packages, The Players Super Bowl Tailgate, the Masters and event tickets, delivering unforgettable experiences to fans. To learn more, visit BullseyeEventGroup.com.